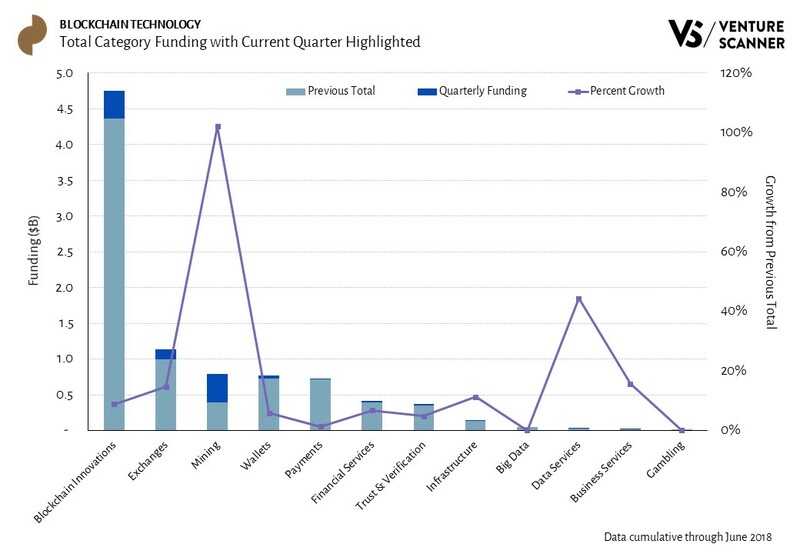 To start off, let’s review the amount of funding raised this quarter by each category within blockchain technology. The above graphic shows that the Mining category leads the sector in Q2 funding with $400M. The Blockchain Innovations category follows in a close second place with $386M. Its funding is almost 3 times higher than that in the next category, Exchanges at $145M. 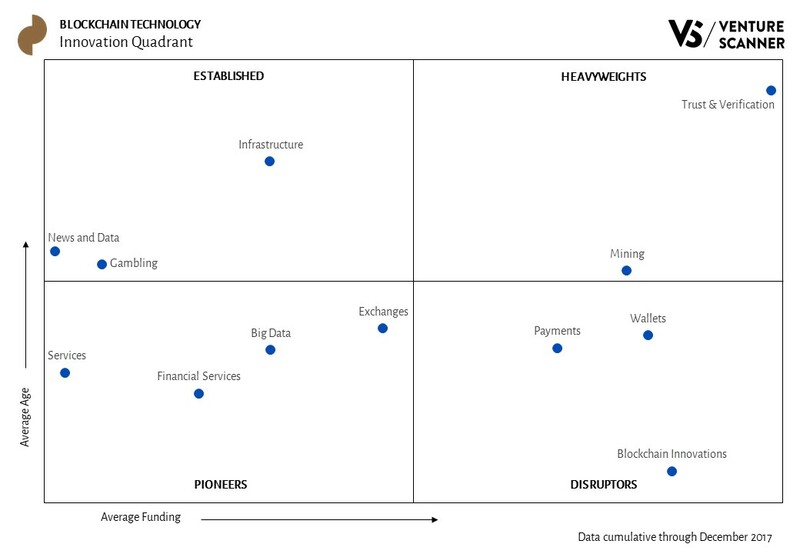 So we’ve observed how different blockchain technology categories stack up in their Q2 funding. But how do these categories’ funding compare with each other historically? Let’s investigate that in the next section. 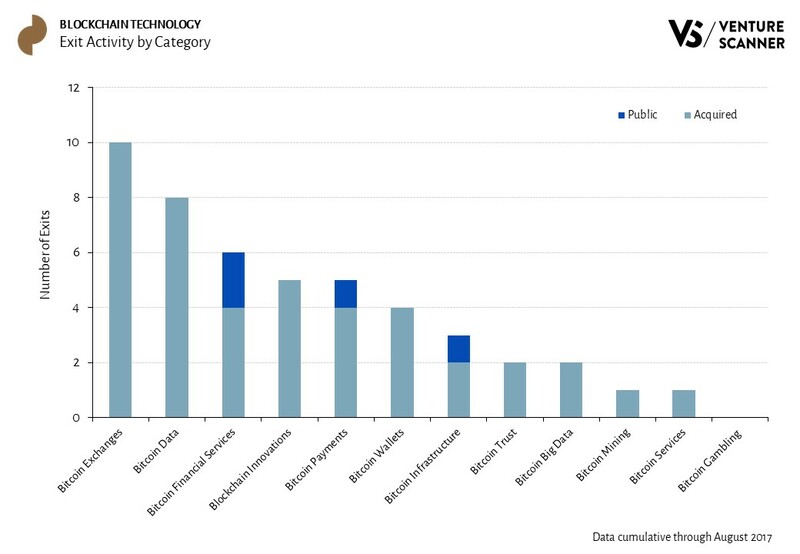 The graph below shows the all-time funding for different blockchain technology categories. The Q2 funding and growth rates of these categories are also highlighted. 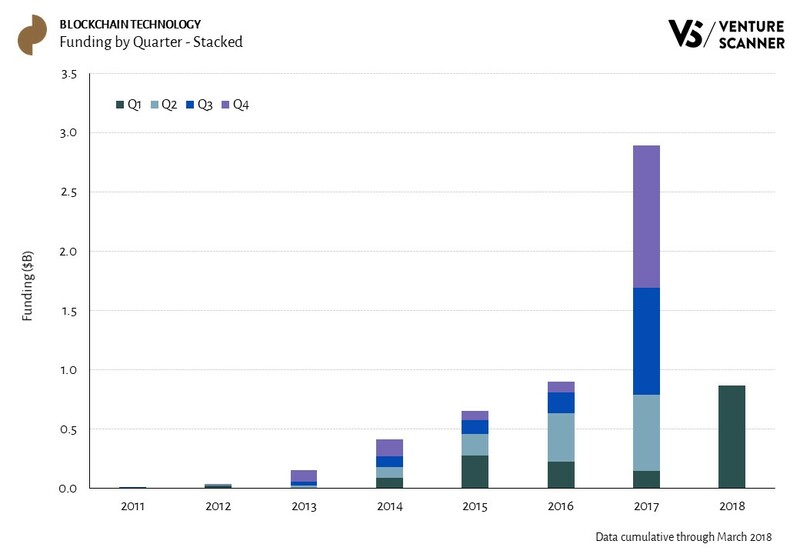 The bar graph indicates that Blockchain Innovations completely dominates the sector with $4.7B in total funding. This is more than four times the funding in the next category, Exchanges at $1.1B. The Blockchain Innovations category contains companies that are working on blockchain distributed ledger technologies. Examples include increased speed for financial transactions, smart self-enforcing contracts, and cross-blockchain interoperability. In addition, the line graph shows that the Mining category saw the highest growth rate in Q2 at 102%, thereby more than doubling its funding. We’ve discovered that the Mining category leads in Q2 funding and had the highest growth percentage. In addition, the Blockchain Innovations category dominates the sector in all-time funding. It’ll be interesting to see if any other blockchain technology categories will catch up in the rest of 2018. Here is our Q2 2018 summary report on the blockchain technology startup sector. The following report includes a sector overview and recent activity. 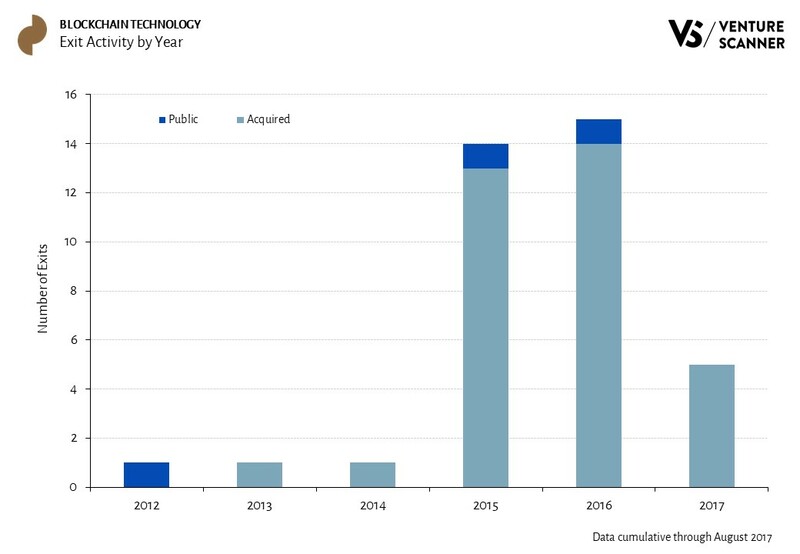 As shown in the graph, the funding amounts in most rounds rose gradually from 2012 to 2015. From 2015 onwards, funding amounts shifted dramatically to ICO events. In fact, the funding amount in ICO events amounted to almost $2B in 2017. We’ll now look at the Blockchain Technology funding amount by round as a percentage of the total, which shows changes independent of the total size. 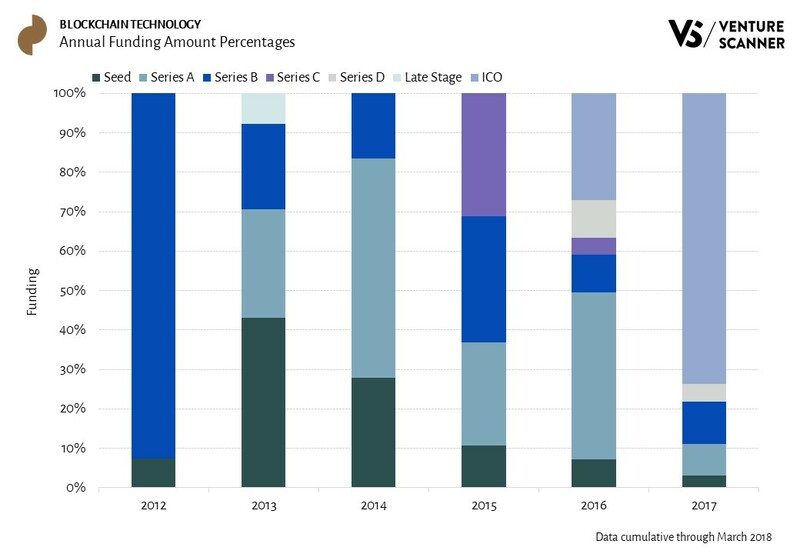 The above graph supports our previous observation that funding amounts saw substantial shifts to ICOs from 2015 to 2017. Initially, early-stage events accounted for almost all of the sector’s funding amounts from 2012 to 2015. In 2016, ICOs emerged on the horizon and took over 27% of the sector’s funding amounts. By 2017, there was a complete shift, with ICO events dominating the sector’s funding amounts at 73%. So we see that the funding amount graphs indicate a drastic shift to ICO events from 2015 to 2017. Would the funding event count graphs show the same trend? Let’s examine them in the next section to find out. Let’s now look at the annual Blockchain Technology funding event counts. The below graph shows the Blockchain Technology funding counts by round as a percentage. This graph confirms our previous observations. 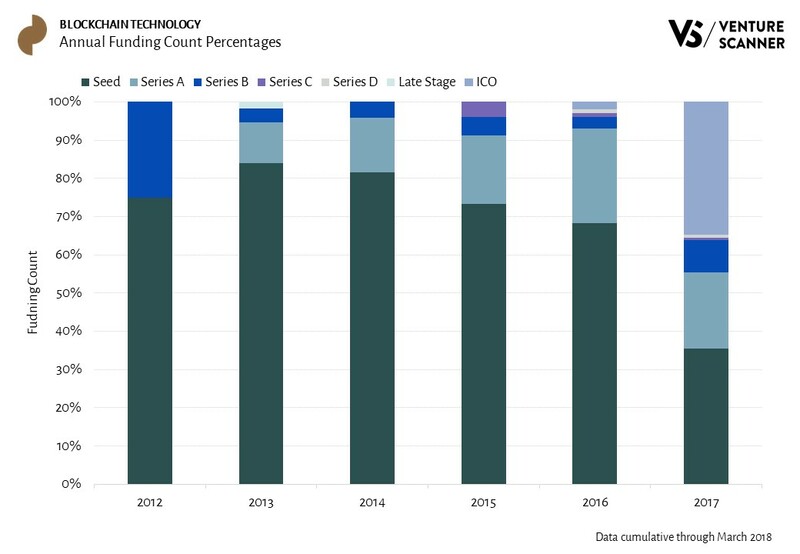 Specifically, ICOs represented 3% of the sector’s funding counts in 2016 and grew to 35% in 2017. As a result, the funding counts in most early-stage rounds decreased by 2017. 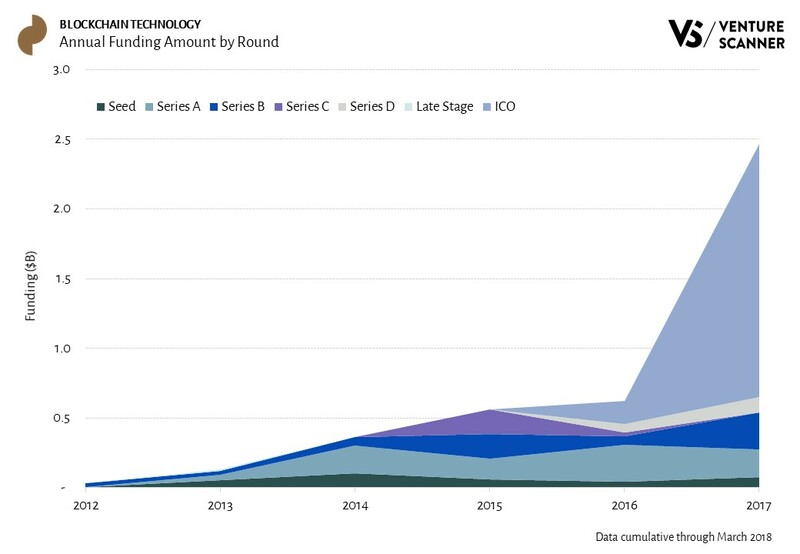 In conclusion, we see that Blockchain Technology funding rounds and events shifted significantly to ICOs from 2015 to 2017. We can see from the Sector Map above that Blockchain Innovations is the largest category with 244 companies. This category contains companies that are working on blockchain distributed ledger technologies. Examples include increased speed for financial transactions, smart self-enforcing contracts, and cross-blockchain interoperability. Some example companies in this category include Blockstream, Filecoin, Blockstack, and Ripple. We have seen what the different categories in Blockchain Technology are and how many companies are within each category. What about their funding and maturity in relation to one another? Let’s look at our Innovation Quadrant to find out. We can see from our Innovation Quadrant above that the categories are rather evenly distributed among the four quadrants. The Pioneers quadrant has the most categories at 4. The Disruptors quadrant and the Established quadrant each have 3 categories. The Heavyweights quadrant has 2 categories. 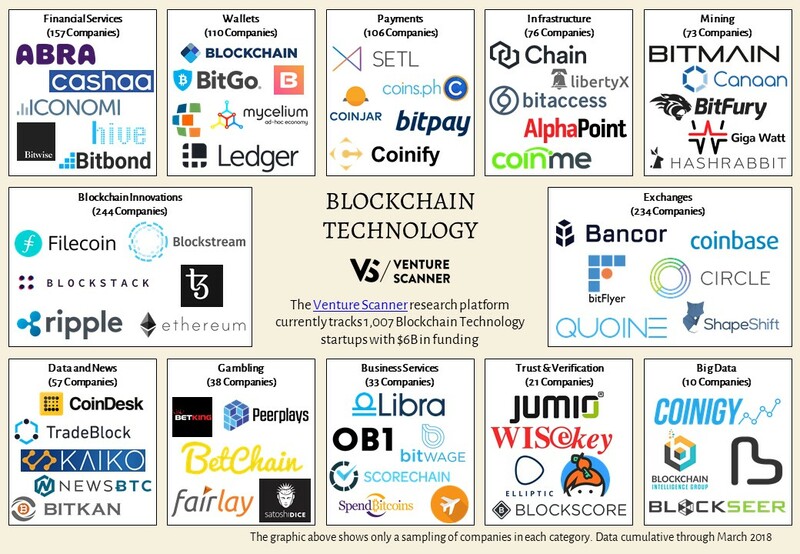 We’ve now seen how the Blockchain Technology sector is categorized. We’ve also seen the relative stages of innovation for those categories. How do these categories stack up against one another in a holistic view? Let’s look at the Total Funding and Company Count Graph. 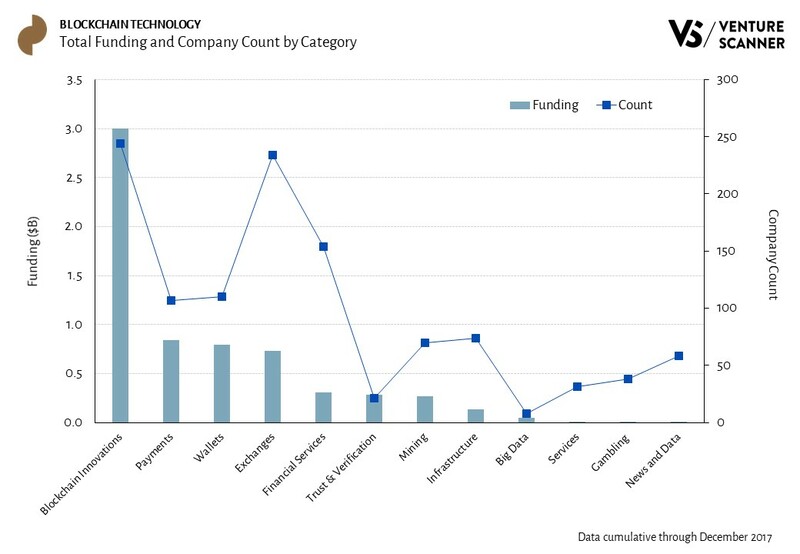 The graph below shows the total amount of venture funding and company count in each Blockchain Technology category. 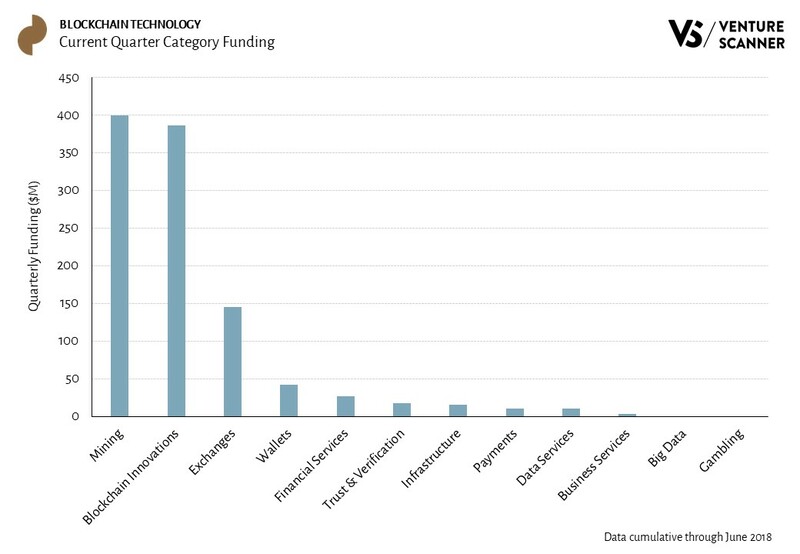 We can see from the graph above that the Blockchain Innovations category leads the sector in total funding at $3 billion. It also has the most companies in the sector at 244 companies. The graphics above show that the Blockchain Innovations category leads the sector in funding and company count. The other categories have large potential for growth and development in this nascent market. It will be interesting to see how this sector turns out in 2018.